*slurp gurgle slurp* *nom* *nom* *nom* BRAAAAAAAAAAAAINS! Stand alone or series: Can be read as a stand alone novel, but is the first novel in a planned trilogy. 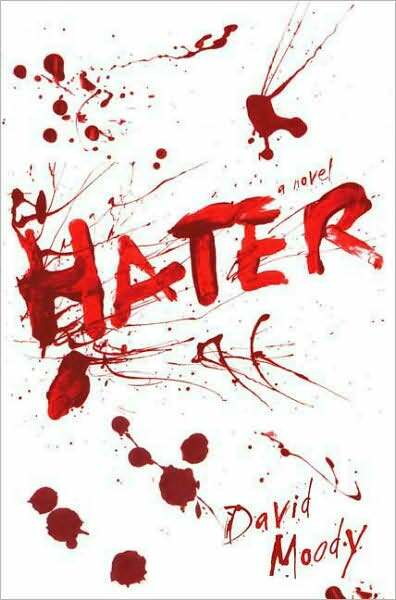 Why did I read this book: Ever since I saw promos and reviews for Hater start to pop up online in February, I’ve been yearning for this book. When we were able to get a review copy months later, we decided to save it for Halloween Week – and here we are! 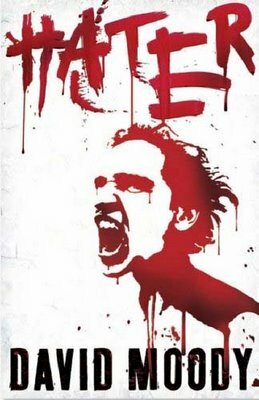 HATER is the story of a world tearing itself apart from the inside, told through the eyes of Danny McCoyne; a lazy, unambitious father of three who does as much as he has to to survive – nothing more, nothing less. Without reason or warning, people begin to turn on each other… a business man attacks and kills an old woman in the street, a teenage girl bludgeons her best friend to death, the lead singer of a band stops mid-concert and attacks his drummer… Suddenly, in the space of just a few short and desperately terrifying days, everything changes. You can no longer trust anyone, no matter how well you think you know them. And when you lock your door and board up your windows to protect your family, are you shutting the nightmare out or locking it inside with you? Danny McCoyne is an everyday man, working an average job, barely making ends meet with his tired wife and three loud, disobedient children. On a day just like any other as he makes his commute to work, he witnesses what appears to be a random act of violence – a man with an umbrella, a bloke just like Danny, probably on the way to a going-nowhere job, suddenly attacks an elderly woman, bludgeoning her to death. Soon, attacks like these become the norm – people everywhere begin attacking others at random. The media dubs the attackers as “haters” and warns people to stay indoors, and to separate themselves from family members that begin to show any violent traits. As the attacks escalate and the hater numbers grow, Danny and his family huddle in their locked flat and hope that they will be spared from the reaches of the violent madness that has overcome the country. Hater is David Moody’s debut novel, and has quite an interesting story concerning its publication. Originally, Mr. Moody published the novel himself, online, only later to be scooped up by major US & UK publishers – and now, apparently, Hater is being adapted by Guillermo del Toro into a film. How ’bout them apples? That said, there was a lot of hype leading up to my reading of this book. And though Hater doesn’t quite live up to the hype, it’s certainly a solid, engaging, fast-paced read that touches on some great concepts. The novel begins slowly, easing the reader into Danny McCoyne’s trapped, monotonous life. As a protagonist, Danny is a far cry from the traditional zombie/horror novel hero – he isn’t noble or driven by lofty ideals. Rather, Danny is your everyday, normal man – with many failings, lack of ambition, and trapped in a job he hates, with a family that he loves but whose constant demands he cannot stand. And when the hater apocalypse strikes, Danny doesn’t suddenly discover his inner-Rambo; no, he remains normal, plain Danny throughout. This characterization is incredibly effective, as is the initial slowness of the book. The power of Hater is in its simplicity, and in how familiar the characters are. Danny McCoyne’s tired, empty life and its endless repetition is something many readers can sympathize with, and sets a believable, familiar stage for the later action. With these strengths, however, came other weaknesses. There’s an unfortunate degree of repetitiveness in the novel as each chapter begins with a brief encounter with different people becoming “haters” and attacking those around them. While this device is effective at the beginning of the book, as the novel goes on, these disparate stories lose their charm – the result is disinterest, and I found myself wanting to skim through these repetitive passages to get back to the “real” story. The other problem I had with the book was with the label of “hater” itself. Understandably, Mr. Moody is a British author, and the term “hater” may not have the same connotation it does in the American vernacular – but in my mind, I couldn’t help but titter a bit at the weird use of slang. The title of “hater” also seems like an awkward misnomer in the context of the book. The people who turn to sudden violence aren’t really “hating” anything, are they? Even from an outside/non-hater perspective, these acts of murder or violence are completely unrelated to anything resembling hate. It seems as though “berserker” or “maniac” or some other term would be a better title (then again, the media is notorious for crappy, catchy names so perhaps this isn’t so far off base). Though Hater takes a bit long to get on with the action, the prolonged inaction and repetition also works to the book’s credit, as it allows the tension and paranoia to build in Danny’s home and in the readers’ minds to near intolerable ways. When the action finally strikes, the last third of the book is compelling stuff, and easily worth the wait. Though Mr. Moody stumbles while trying to explain the origins of the “hater” emergence, it’s not really so important how or why the pandemic spread – just that it has, and the ensuing events are terrifying. As with the best in the zombie genre, Mr. Moody examines not only the carnage that occurs with the apocalypse, but he also scrutinizes human nature in all its cruelty, clearly alluding to current social issues in our sensationalistic, media-driven world of fear. As the novel comes to a dramatic crescendo, the question arises – who are the true monsters? Those “haters” attacking on some uncontrollable imperative? Or the “normal people” who kill out of fear, paranoia and spite? He stopped walking when he saw her. At first she was just another face on the street, nondescript and unimposing and as irrelevant to him as the rest of them were. But there was something different about this particular woman, something which made him feel uneasy. In a split-second she was gone again, swallowed up by the crowds. He looked round for her anxiously, desperate to find her amongst the constantly weaving mass of figures which scurried busily around him. There she was. Through a momentary gap in the bodies he could see her coming towards him. No more than five feet tall, hunched forward and wearing a faded red raincoat. Her wiry grey-white hair was held in place under a clear plastic rain-hood and she stared ahead through the thick lenses of her wide rimmed glasses. She had to be eighty if she was a day he thought as he looked into her wrinkled, liver-spotted face, so why was she such a threat? He had to act quickly before she disappeared again. He couldn’t risk losing her. For the first time he made direct eye contact with her and he knew immediately that he had to do it. He had no choice. He had to do it and he had to do it right now. Dropping his newspaper, briefcase and umbrella Simmons pushed his way through the crowd then reached out and grabbed hold of her by the wide lapels of her raincoat. Before she could react to what was happening he spun her round through almost a complete turn and threw her back towards the building he’d just left. Her frail body was light and she virtually flew across the footpath, her feet barely touching the ground before she smashed up against the thick safety-glass shop window and bounced back into the street. Stunned with pain and surprise she lay face down on the cold, rain-soaked pavement, too shocked to move. Simmons pushed his way back towards her, barging through a small crowd of concerned shoppers who had stopped to help. Ignoring their angry protests he dragged her to her feet and shoved her towards the shop window again, her head whipping back on her shoulders as she clattered against the glass for the second time. ‘What the hell are you doing, you idiot? !’ an appalled bystander yelled, grabbing hold of Simmons’ coat sleeve and pulling him back. Simmons twisted and squirmed free from the man’s grip. He tripped and landed on his hands and knees in the gutter. She was still on her feet just ahead of him. He could see her through the legs of the other people crowding around her. ‘Please…’ she begged as he sunk the sharp metal tip of the umbrella deep into her gut and then yanked it out again. She slumped back against the window, clutching the wound as the stunned and disbelieving crowd quickly engulfed Simmons. Through the confusion he watched as her legs gave way and she collapsed heavily to the ground, blood oozing out of the deep hole in her side. ‘Maniac,’ someone spat in his ear. Simmons span around and stared at the owner of the voice. Jesus Christ, another one! This one was just like the old woman. And there’s another, and another… and they were all around him now. He stared helplessly into the sea of angry faces which surrounded him. They were all the same. Every last one of them had suddenly become a threat to him. He knew there were too many of them but he had to fight. In desperation he screwed his hand into a fist and swung it into the nearest face. As a teenage boy recoiled from the sudden impact and dropped to the ground a horde of uniformed figures weaved through the crowd and wrestled Simmons to the ground. As I mentioned above, Hater is soon to become a movie, from Producer (and new author himself) Guillermo del Toro – you may have heard of him (Pan’s Labyrinth, Hellboy, Hellboy II: The Golden Army, The Hobbit). Also on the film are Mark Johnson (The Chronicles of Narnia films), and will be directed by J A Bayona (El Orfanato/The Orphanage). That’s a helluva lineup! While we wait for the film, check out the book trailer below. And get ready for book 2, Dog Blood out in June 2010. Thank you for this review as I had wondered how this book would go (like you, I was intrigued by the premise). I might give it a try. The other problem I had with the book was with the label of “hater” itself. Understandably, Mr. Moody is a British author, and the term “hater” may not have the same connotation it does in the American vernacular – but in my mind, I couldn’t help but titter a bit at the weird use of slang. The title of “hater” also seems like an awkward misnomer in the context of the book. The people who turn to sudden violence aren’t really “hating” anything, are they? Even from an outside/non-hater perspective, these acts of murder or violence are completely unrelated to anything resembling hate. I suspect you’re right that it’s a cultural issue. Hate is considered a strong word here in most parts of the UK. When we don’t approve of something we tend to be subtle, such as “That’s simply not on” or “I’m not quite keen on that”, because ‘hate’ has a well-documented history of verbal and – sometimes, random and mindless – physical violence. Thank you for the great post & review. I loved the excellent excerpt & book trailer. I have HATER on my ToGet&Read list. Did you know David Moody is on Twitter? Maili – I figured it would be something due to cultural differences 🙂 In American slang, a “hater” is someone who is disapproving because of jealousy. And often used in conjunction with “player” (one who is promiscuous and dates multiple people – who are usually ignorant that they are being “played” – at the same time) i.e. “Player Hater.” LOL. I can understand what Mr. Moody was going for, but it’s hard to shake the other “hater” from my mind. That said, despite the slow start and repetition, I think this is a solid book and definitely worth reading! I hope you get a chance to give this one a read!